'Cold Actually Feels Good' At The U.S. Winter Swimming Championship Last weekend, more than 40 swimmers from around the country competed in the inaugural U.S. Winter Swimming Championship in northern Vermont. They swam in a two-lane pool cut into an icy lake. 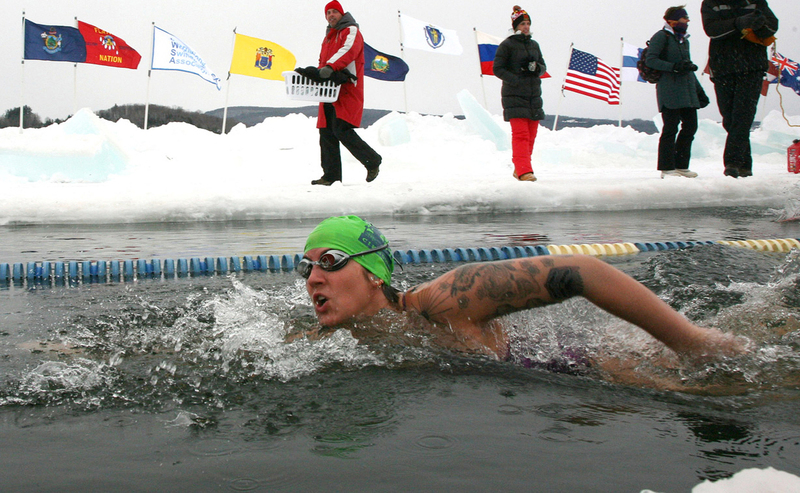 Daina Bouquin competes in the first U.S. Winter Swimming Championships on Saturday in Lake Memphremagog near Newport, Vt. The event drew swimmers from around the world to race in icy water that was below 32 degrees F.
"Yeah, it's acclimating to the cold because most people forget that cold actually feels good," she says. "If you have a sore knee, if you have a sore elbow, you put an ice pack on it, and the first nine seconds of that, it's horrible." 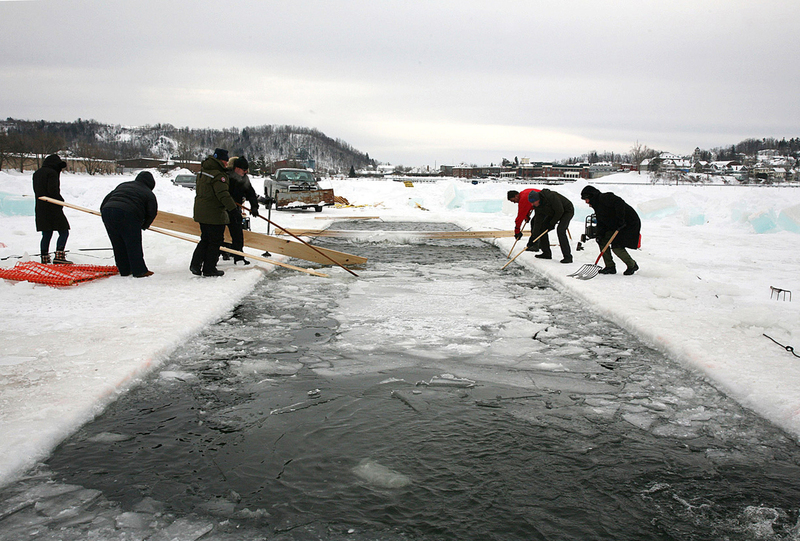 Volunteers clear ice from the swimming lanes before the start of the first Winter Swimming Championships in North America on Saturday in Newport, Vt., in Lake Memphremagog. Elaine Howley, of Waltham, Mass., says these races are much shorter and colder than her previous dive in the English Channel. She says she's not sure how she'll do in this race. "This sort of thing sounds like a really great idea when you are a couple of beers into the night, and you get down in the morning, and it's like, 'Oh, good God, what have I done?' " she says. Outside on frozen Lake Memphremagog, a generator hums. It powers a bubbler at the bottom of the 25-meter rectangle that's been cut into the ice and lined with wood. The bubbler is supposed to keep the 30-degree water from freezing, but it's so cold a few swimmers have to keep fishing out ice chunks as they wait for the day to warm up a bit. Aleksandr Yaklovev is from Latvia, where he trains with an ice swimming club for the international circuit. Some swimmers on his team take only cold showers during racing season. "It's very dangerous, cold water killing, but we know exactly the language with cold water," he says. "We can swim, we can take this high positive energy and be happy." 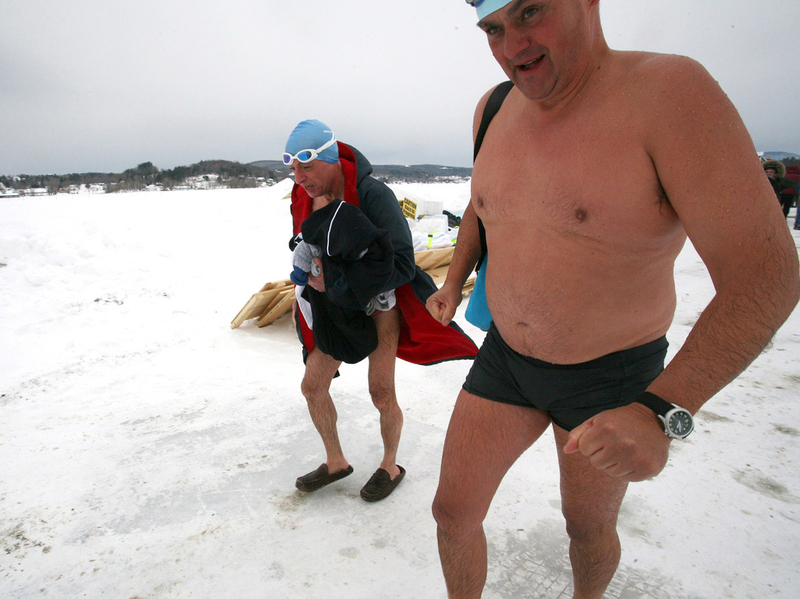 Silverio Bracaglia (left) and John Coningham-Rolls of London walk back to the warming hut after competing in the first U.S. Winter Swimming Championships at Lake Memphremagog in Newport, Vt. Under a row of wind swept international flags stuck in a snow bank, a regal looking woman in a white down jacket greets her many admirers. "You know, people have done it for thousands of years, even the ancient Greek people knew what the good benefits of cold water are to the human body," says Mariia Yrjö-Koskinen, a Finland native and the president of the International Winter Swimming Association. "It releases the natural endorphins. I have said that it's the best endorphins you can get from the nature." The 52-year-old mother of four says winter swimming keeps her healthy, and she's never in the water long enough to get hypothermia. When it's her turn to race in the 25-meter breaststroke, she lowers herself calmly down a makeshift wooden ladder into the frigid water. She wears only a bathing suit, a cap, and a string of pearls. With graceful strokes — no thrashing, no gasping — she pulls ahead of her male competitor and emerges at the other end. About 40 other swimmers competed in 25, 50, and 100 meter events, and no one bailed out or got hurt. Even though, most of them agreed, this water was colder than it was for another race in Siberia.